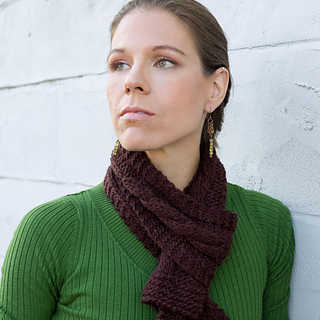 This simple scarf pattern is appropriate for knitters who are trying cables for the first time. Simple enough design for conservative men, and elegant enough for ladies. Juniper Moon Farm Chadwick yarn is super soft and can be worn against the skin. It also “knits like butter”. One of my favorite yarns to knit with. One full skein of Chadwick (pictured) is an appropriate length for men or ladies who like to keep it tucked neatly. Two skeins gives enough length for multiple wrapping options for those who like longer scarves.